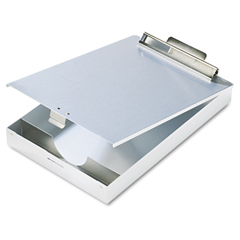 • For outdoor or indoor use • Durable recycled aluminum with antimicrobial protection With built-in storage box. Holds forms and pencils under tightly closed lid. Strong clip controls papers even in brisk wind. Holds forms to 8-1/2 x 12. 1" clip capacity.